Using a spacer with your metered dose inhaler (MDI, inhaler or puffer) can reduce side effects, especially from steroid inhalers. Using a spacer can also make the medicine you breathe in up to 50% more effective by helping to get the correct dose into your lungs. Adults and older children can place the mouthpiece of the spacer directly into their mouth. The mask in the picture below is only for children who can't seal their lips around the mouthpiece – usually up to two to three years of age. This is the recommended method, except for small children, or if you are very breathless. 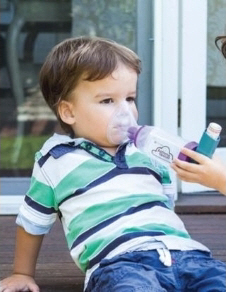 Shake the inhaler vigorously to mix the medication and propellant. Position the mouthpiece in your mouth and ensure a good seal. Give one puff of the medication into the spacer. Take a long, slow, deep breath in, hold your breath for at least five seconds, or as long as is comfortable. Breathe out. Repeat if you need more puffs of medication. This is best in an emergency and for small children. Press once for one puff. Allow about four normal breaths through the spacer, checking that the valve is moving. Remove the inhaler from the spacer. Repeat the above steps if you need further doses. Wash a new spacer before use and then every week. Remove the base from the spacer. Wash it in warm water with detergent in a clean bowl. Remove the spacer from the water and allow it to drip dry. Replace the base when the spacer is dry. Clean your inhaler regularly so that the hole at the bottom where the medication comes out doesn't get blocked, otherwise you won't get the full dose of medication. You should clean your inhaler every week. Remove the metal canister from the plastic inhaler. It is important that the metal canister does not get wet. Rinse the cap and the mouthpiece of the plastic inhaler under warm water for 30 seconds. Shake off the excess water and dry thoroughly with a paper towel. When completely dry replace the metal canister and mouthpiece cap. Intal Forte or Tilade are sticky and block the inhaler easily, so you should clean them every day. They usually come with a spare plastic case so you can use one while cleaning and drying the other. Never wash inhalers containing inhaled steroid medications. Wipe them with a dry tissue. How can I tell if my inhaler is empty? When you shake the inhaler, you should be able to feel or perhaps hear the medication inside. If you are not sure, spray a puff of medication into the air. You will be able to see the spray coming out of the inhaler, and hear a whooshing noise. If there is no spray or noise, the inhaler is probably empty. If you haven't used your inhaler for a week or more, spray a puff into the air before using it. This will ensure that your inhaler will work properly. Make sure you have a spacer available for home and work or school. Replace your spacer with a new one after six months of regular use or 12 months of intermittent use. You can get a new spacer from your doctor or pharmacy. 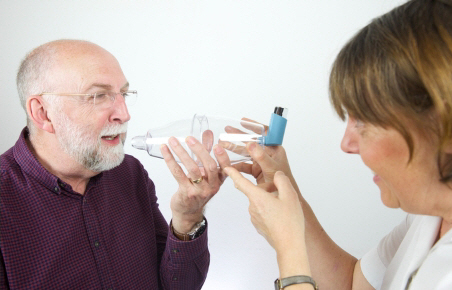 The National Asthma Council of Australia has videos showing how to use a spacer on this page. Written by Child Health, Christchurch Hospital, Canterbury DHB. Adapted by HealthInfo clinical advisers. Last reviewed March 2017.